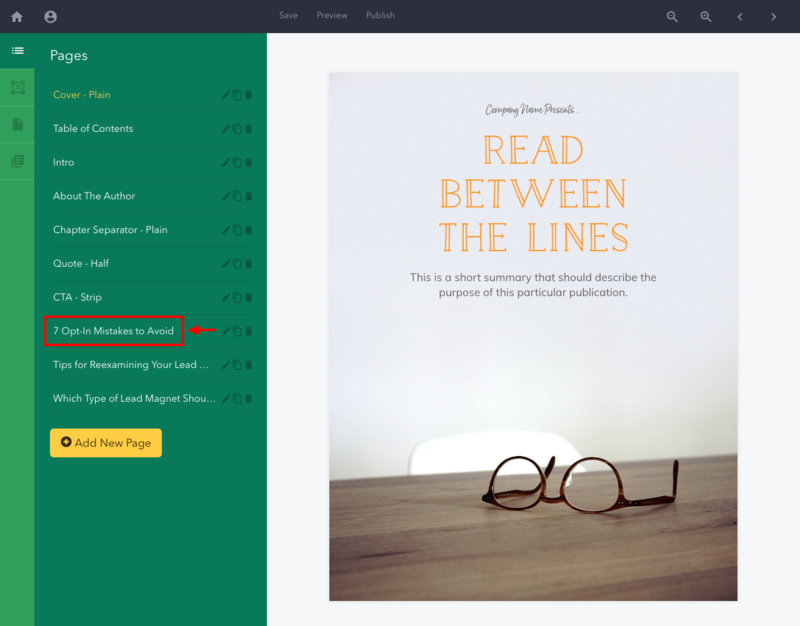 This step-by-step tutorial will show you how to recycle your existing blog posts into an eBook. eBooks are one of the most popular lead magnets around. And for good reason – they’re a fantastic way to share detailed knowledge and insight that just won’t fit into a blog post. But many people new to the world of lead magnets are daunted by the prospect of an eBook. They automatically assume that big budgets and months of writing are required in order to publish something worthwhile. Thankfully that’s not the case. We’re going to use a technique known as content recycling. We’ll take some content that was originally published as a series of blog posts and convert that into an eBook. 1) It saves time. This content has already been written, edited and published. The most time consuming tasks have already been done. 2) You already know if the content is popular. Did people read it the first time the content was published? If so, then reformatting that same content can make it more accessible to a new audience. If you’re worried about readers feeling cheated with recycled content, don’t. It’s highly unlikely that your website visitors have read every piece of content on your blog. I’ll also show you some techniques for providing additional value to loyal readers. This is the type of content that is still relevant months and years after it is published – it contains tips, techniques and strategies that won’t go out of date. You should aim to use content that you are fairly certain will be popular with your readers. Since this content has been published previously you can measure how popular it was by looking at your Google Analytics. To do this, log in to your Analytics account and set a wide date range of at least 12 months. If your blog has been around for longer than that then increase the range as much as you can. This helps to get a sense of what content has been consistently popular over a long period of time. Next, choose the ‘site content’ option underneath the ‘analysis’ menu. Finally, sort the table by ‘page views’. It’s important to focus on page views here rather than unique views. If people are returning to your content then it’s another signal that it’s popular and will work well if republished in a different format. When combining blog posts into an eBook it’s really important that the book has a natural flow for the reader. To ensure this you should only include content from related categories. 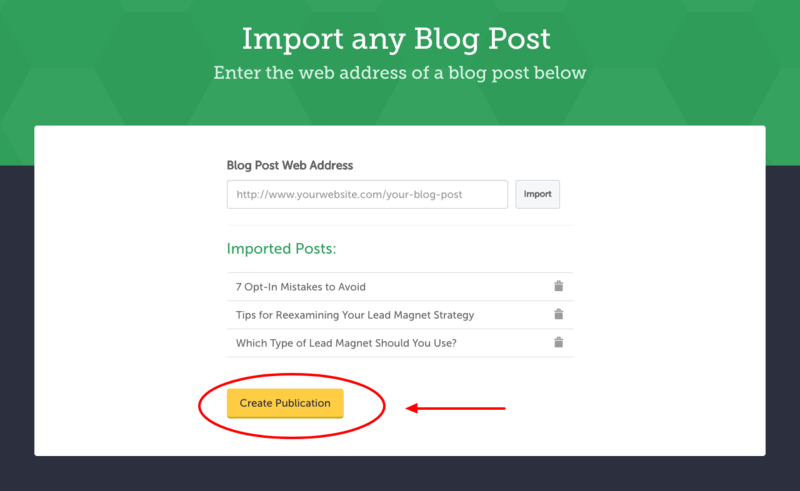 Remember the fist rule of lead magnets: you should aim to provide content that relates to a specific audience in a specific situation. It’s impossible to do that if your eBook contains content on a wide range of topics. Once you have decided what content you want to include in your eBook you can then think about actually making the thing. Phew! 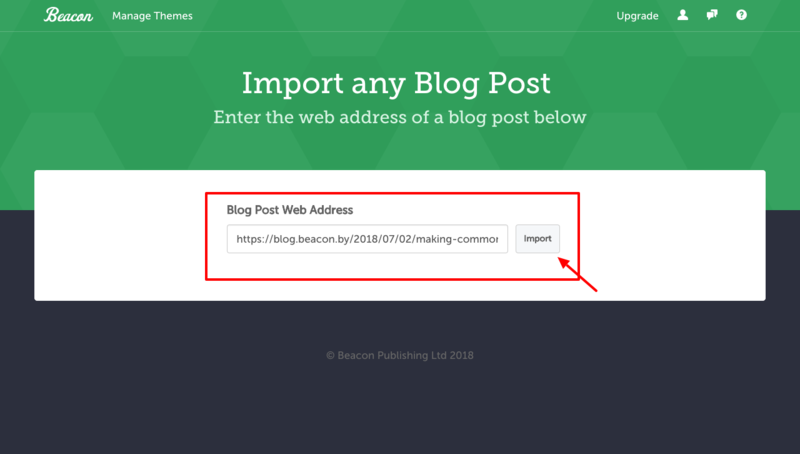 To do this we’ll be using Beacon to automatically convert your blog posts into the eBook format. 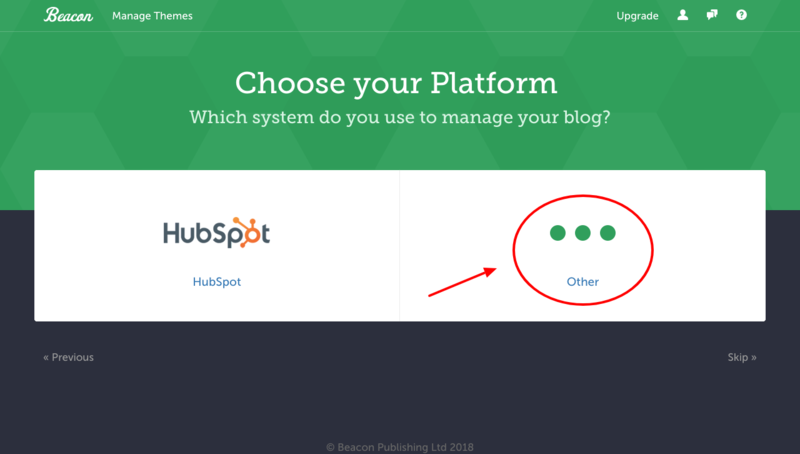 Once you have created your free Beacon account you will be presented with a choice of lead magnets to create. 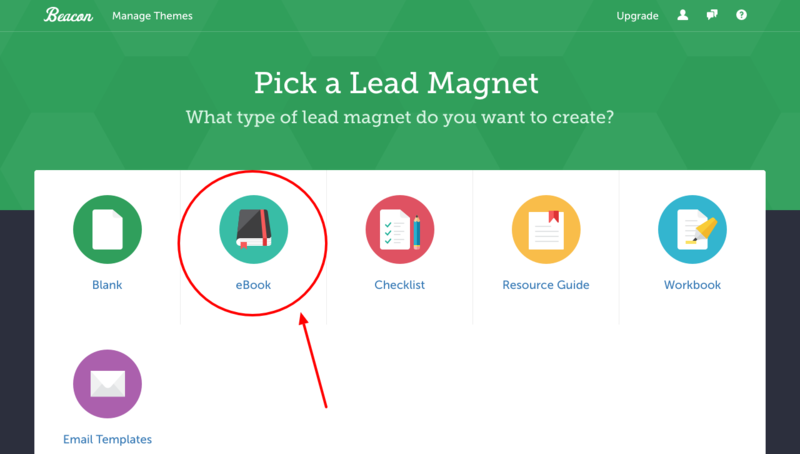 For this lesson we will be picking the “eBook” lead magnet. 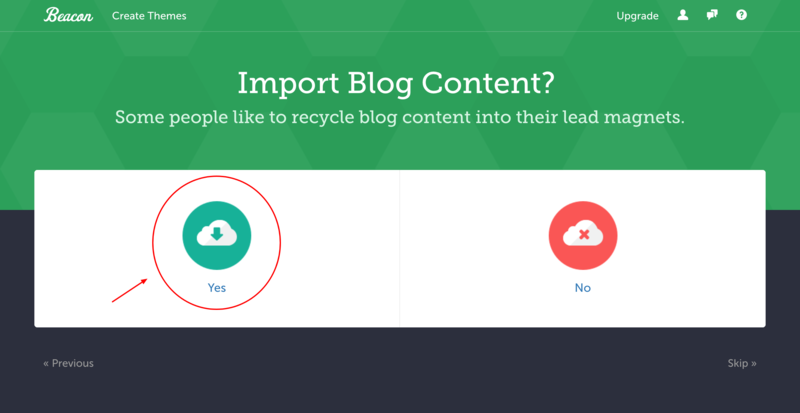 Next, choose ‘yes’ when asked if you want to import content. You can add as many blog posts as you want with this technique but the ideal length of an eBook will consist of 3-7 blog posts. Many people fall into the trap of making one incredibly long eBook as they think that longer = more value. That just isn’t the case. People will be intimidated by a book that is very long and ultimately they just won’t read it. It’s impossible to give people value if you can’t get them to read your content. If you find yourself struggling to condense your eBook into a shorter length then you may want to consider creating a series of mini eBooks instead of a single long one. Once you have all the content chosen, click the ‘create publication’ button. If you can’t find something that is 100% right then don’t worry. The trick is to pick a template that is close to the vision you have in your head for the eBook. This way you can make minor adjustments to suit your brand rather than starting from scratch with a blank canvas. At this stage your book is 90% completed. We can see a preview of the finished product on the right hand side. And if you look under the pages tab you can see that Beacon has combined your original blog posts with a number of other pages including a cover page, table of contents and introduction. This additional content is part of what separates an eBook from a random collection of blog posts. The introduction for example allows you to introduce the key themes explored in the book so readers will know what to expect. The “About the author” page allows you to show your expertise and establish trust with the reader. 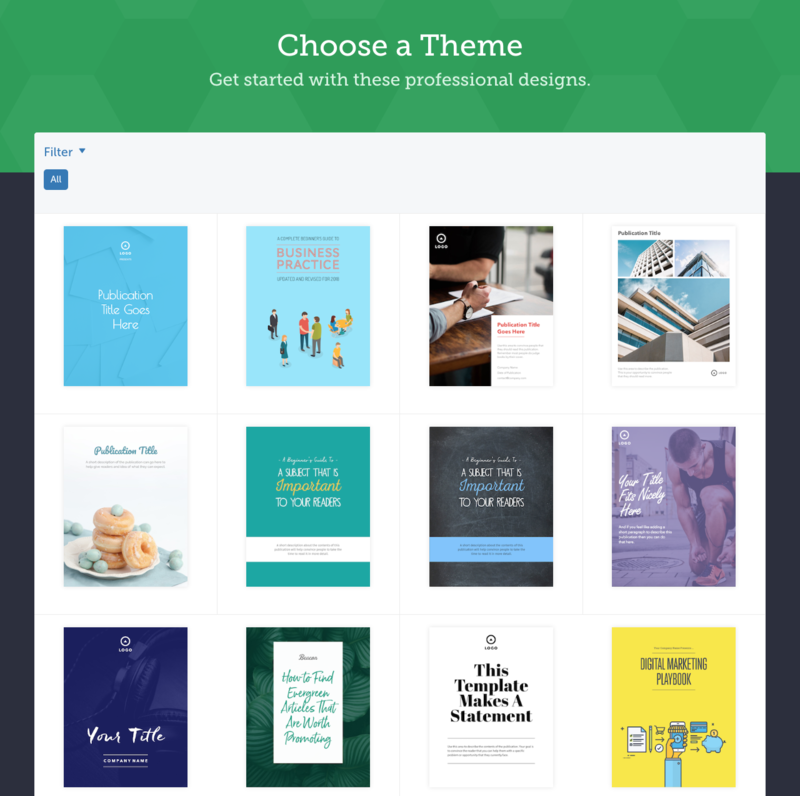 With Beacon, these extra pages come with sample content that will help you to understand what content you should include here. You can delete any of these pages or add extra pages with the click of a button. 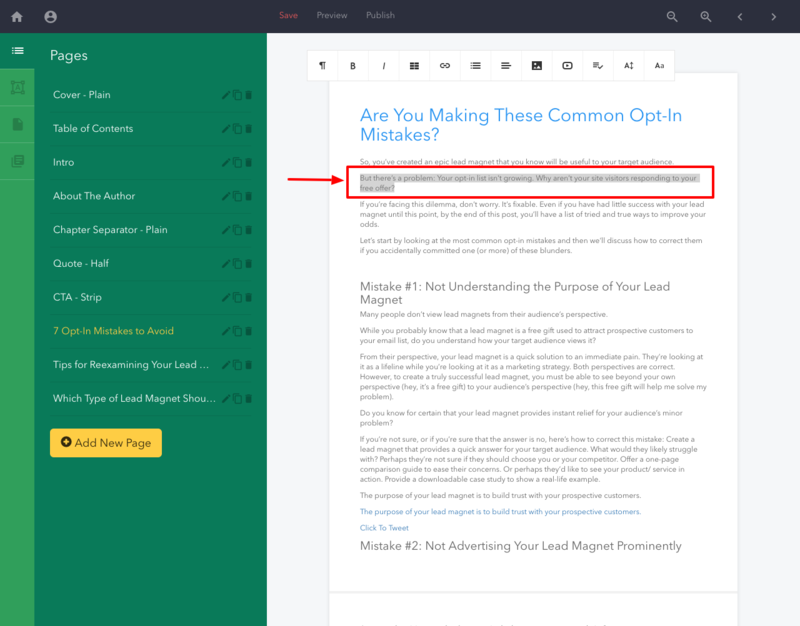 These additional pages are a great opportunity to provide extra value for people who may have read some of your original blog posts. Now, it’s unlikely that your original blog posts were written with an eBook in mind so you may have to edit them slightly for this new format. To do that, we should navigate to one of the imported posts by clicking on the title. From here you can see that all the original formatting of the blog post has been persevered. The headlines, quotes, links and images are still in place. One of the big objections I hear about recycling blog content into an eBook is that there will be no natural flow between the imported content as the blog posts weren’t really written to be read one after another. To combat this I recommend the teacher technique. Remember when teachers began a new lesson by recapping the previous lesson? You can do the same thing with your imported posts. Slight amendments to both the introduction and conclusions of each blog post will help to make sure that each article flows naturally into the next. And there you have it – in just a couple of minutes we have been able to recycle existing blog content into a brand new, professionally designed eBook. Add a call-to-action page at the end of you eBook. What is the one action that you would like people to take after reading your book? Should they buy a product? Or book a consultation? Make a clear call to action to nudge them in the right direction.